SQL skills pay well and the technology is among the most popular as indicated by a big new developer survey from Stack Overflow, which tracked everything from caffeine consumption to indentation preferences. 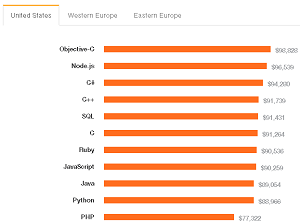 While Objective-C was reported as the most lucrative technology to learn -- garnering an average salary of $98,828 in the U.S. -- SQL wasn't far behind, coming in at No. 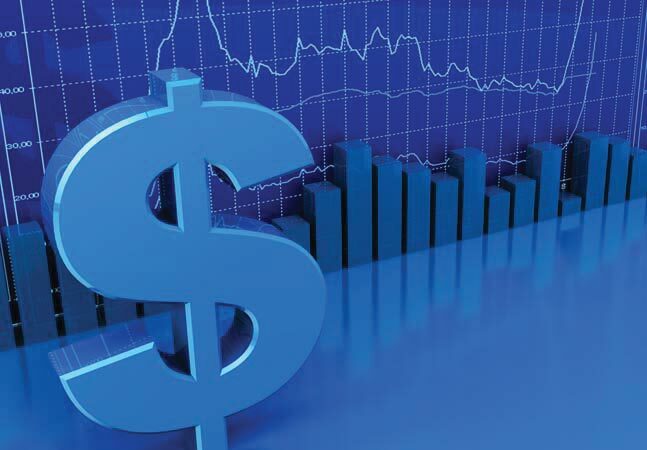 5 on the list with an average reported salary of $91,431 in the U.S. These results are inline with previous such surveys from a few years ago, showing SQL isn't losing much ground in the technology wars. "These results are not unbiased," Stack Overflow warned about the new survey. "Like the results of any survey, they are skewed by selection bias, language bias, and probably a few other biases. So take this for what it is: the most comprehensive developer survey ever conducted. Or at least the only one that asks devs about tabs vs. spaces." Stack Overflow, in case you didn't know, is the go-to place for coders to get help with their problems. The site reports some 32 million monthly visitors. Using this unique status, the site polled 26,086 people from 157 countries in February, posing a list of 45 questions. One of the key areas of inquiry concerned salaries, of course. 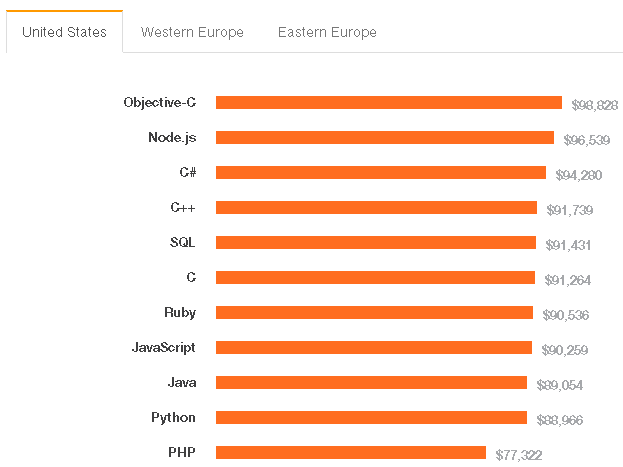 The survey found that behind Objective-C, the most lucrative skills were Node.js., C#, C++ and SQL. But if it's purchasing power you're interested in, Ukraine is tops -- at least according to the metric of how many Big Macs you can buy on your salary. It also might help to work remotely, as coders who don't have to fight commute traffic earn about 40 percent more than those who never work from home. On the technology front, Apple's young Swift language was the most loved, Salesforce the most dreaded, and Android the most wanted (devs who aren't developing with the tech but have indicated interest in doing so). Interestingly, the popular Java programming language didn't make the top 10 list of most loved languages, or most dreaded, though it was in the middle of the pack for most wanted and came in at No. 3 in overall technology popularity. NotePad++ is the most popular text editor, followed by Sublime Text, Vim, Emacs and Atom.io. 1,900 respondents reported being mobile developers, with 44.6 percent working with Android, 33.4 percent working with iOS and 2.3 percent working with Windows Phone (and 19.8 percent not identifying with any of those). The biggest age group is 25-29, where 28.5 percent of respondents lie. Only 1.9 percent of respondents were over 50. Only 5.8 percent of respondents reported themselves as being female. Most developers (41.8 percent) reported being self-taught, with only 18.4 percent having earned a master's degree in computer science or a related field. 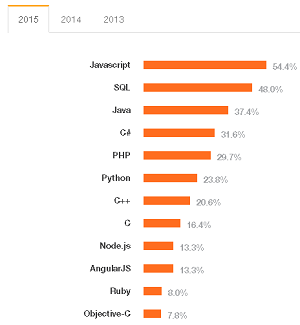 Most respondents identified themselves as full-stack developers (6,800). Two reported being farmers. And, oh, by the way, Norwegian developers consume the most caffeinated beverages per day (3.09), and tabs were the more popular indentation technique, preferred by 45 percent of respondents. Spaces were popular with 33.6 percent of respondents. But there's more to that story. "Upon closer examination of the data, a trend emerges: Developers increasingly prefer spaces as they gain experience," the survey stated. "Stack Overflow reputation correlates with a preference for spaces, too: users who have 10,000 rep or more prefer spaces to tabs at a ratio of 3 to 1." I'm a spaces guy myself. How about you?